Posted: Fri Jul 06, 2007 12:13 am Post subject: SNAIL FORUM STICKERS. I finally drew Snail Forum sticker! Snail Crew hopes that stickers will be available in World Meeting Sweden! Price will be 1 euro. I am very interressé by the sticker, but I do not go by to Sweden! étienne, can you m'en rammener one, I will refund you without soucy! How those who won't be in Sweden can order ? (like me for example !). Posted: Fri Jul 06, 2007 1:22 am Post subject: Re: Snail Forum Stickers! After worldmeeting, I will ship for those won't come in Sweden! Yeah ! The sticker is great ! I want some too ! And after looking at all these modified cars, I want to modify one of mine too ! 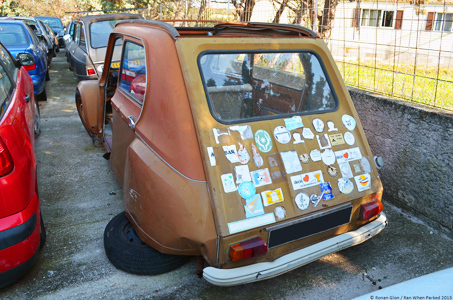 Anyway with such a sticker I will need a modified car ! If you has some in Sweden, I t'en buy. 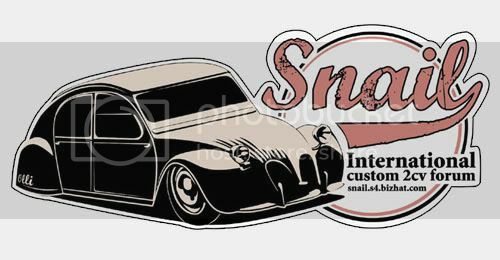 Profits of the sticker will be use to buy a better forum adress, like www.snailforeum.com or www.snail2cvforum.com ! Pascal, you have a cool Ami Super ready to make something cool with it! You should start a projekt topic! The idea was to make a sticker in a very nostalgia custom way to illustrate the "spirit" of SNAIL forum! So van with big wheel and iron cross is so obvious exagerate, we didn't want use that kind of illustration! wow, thats amazing. love the design! the Ami will definitly be wearing one of them! will have to come and see you in Sweden for a few! Are you also at Spa this year. The race is at saturday 10 and sunday 11 november. but it will be still one of the hotest 2cv meeting!! I hope to be there again, and maybe Olli will be there too! For the price with shipping, I will say that after worldmeeting!